Southwest Fight News was in attendance today, at the Golden Boy/Golden Girl Productions press conference for the Maldonado VS. Carcamo card, at Santa Anna Casino. Stephanie “Golden Girl” Jaramillo was exited to be promoting the event in tandem with Oscar de la Hoya’s Golden Boy Productions. She expressed gratitude to her husband Dominic Gonzales for helping make her dreams of being a promoter come true. She was also thankful to the fighters for competing on the upcoming card, and promised to “fight for them because she’s not just a promoter, but also a fighter” Stephanie has broken boundaries as a female promoter and the upcoming April 28th event will be no exception. Fighters on the card and their coaches all spoke, and were thankful to the promoters, family and friends for their support. Headliner, 13-0, WBC lightweight youth champion, Fidel Maldonado will be defending his title for the first time against Fernando Carcamo, and promised a great show. There wasn’t a lot of trash talk, but Jesus Correa JR. did make mention of how he “had fought Charles Alderete as an amateur, but this isn’t an amateur fight” hinting that he would be taking things to the next level in his pro debut. 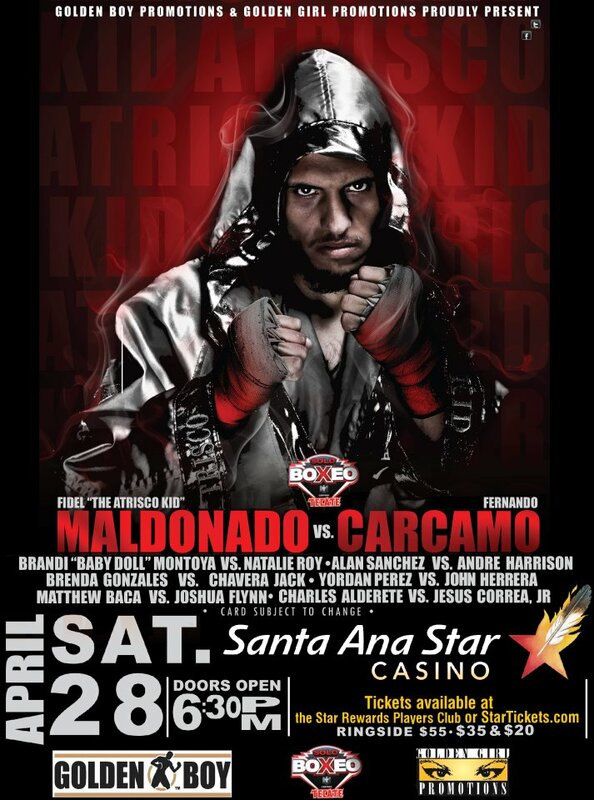 Fidel Maldonado Headlines April 28th Event.